What is it? We’re calling it “WP Reasons” and it’s a public domain marketing flyer/brochure about the reasons to use WordPress, brought to you by some members of the WordPress community. 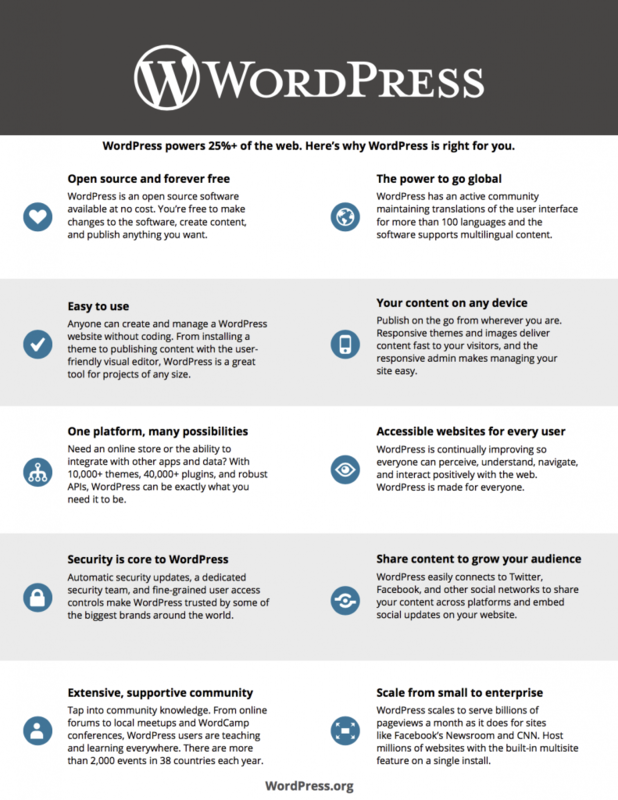 The flyer / brochure is a printable, one-page document explaining the reasons why WordPress is a great content management system for many types of projects. It’s a great fit for printing up at meetups and WordCamps for distribution, or sharing with clients or anyone interested in learning more about WordPress at a high-level. InDesign files and OpenSans fonts. An editable and printable PDF. A basic HTML file containing just the text of the document. A png of the document. The text in the document (not including the WordPress logo or trademark) is licensed under CC0 1.0 Universal (CC0 1.0) Public Domain Dedication. Anyone can copy, modify, distribute and perform the work, even for commercial purposes, all without asking permission. Icons are from the Genericons project, a free, GPL, flexible icon font. Created during WordCamp US 2015’s Contributor Day, the following people contributed to the initial version: Sarah Blackstock, Andrea Bishop, Collin Matthews, Gabriel A. Mays, Sara Rosso, Eileen Violini, and Andrea Zoellner. It currently lives at my GitHub repo here: https://github.com/sararosso/WP-Reasons (and all of the above information is available there, too). Similar to the Security White Paper, I’ll host and accept multiple versions and translations for the rest of the WordPress community. Share it, hack on it, translate it. Thanks to everyone who helped! If you’re doing a meetup or WordCamp in the future in a global location, why not set aside some time to work on your language’s translation? There’s a section on getting started translating the white paper here.